A new analysis from Trout Unlimited shows the U.S. Geological Survey underestimates the number of streams nationwide that flow only following rain. The fishing and conservation group says that for every mile of stream mapped in the National Hydrography Dataset, another 1.5 miles of ephemeral streams exist. The analysis comes as the Trump administration is soliciting comments on its Waters of the U.S., or WOTUS, rule that would eliminate Clean Water Act protections for ephemeral streams, which flow only following rainfall. Outdoors groups like Trout Unlimited fiercely oppose the proposal, arguing that ephemeral streams serve as critical habitat for fish species and contribute crucial supplies of cool, clean water to more habitat downstream. The Trump administration has said it can't determine how many streams stand to lose federal protections under its WOTUS proposal. After first denying there were any data on the number of ephemeral streams nationwide, the administration now says that because the National Hydrography Dataset is incomplete, it is unusable. Trout Unlimited, however, views the data set as an important tool to determining the impact of the rollback. "It's the best available data; it's what we have to work with," Trout Unlimited mapping specialist Kurt Fesenmyersaid. "There are shortcomings, and we wanted to highlight potential areas the data misses." The National Hydrography Dataset shows that 18 percent of streams nationwide are ephemeral, meaning they stand to lose protections under the Trump WOTUS proposal. But USGS only recently started differentiating between intermittent and ephemeral streams in the database, and the agency cautions that the data are incomplete. To help find areas where rainfall would drain into channels and form ephemeral streams, Trout Unlimited overlaid the National Hydrography Dataset maps on elevation maps. Fesenmyer's team consulted other studies of when and where ephemeral streams form. That science showed that ephemeral streams initiate in steep areas where more than 2 acres of a watershed drain to a particular point. 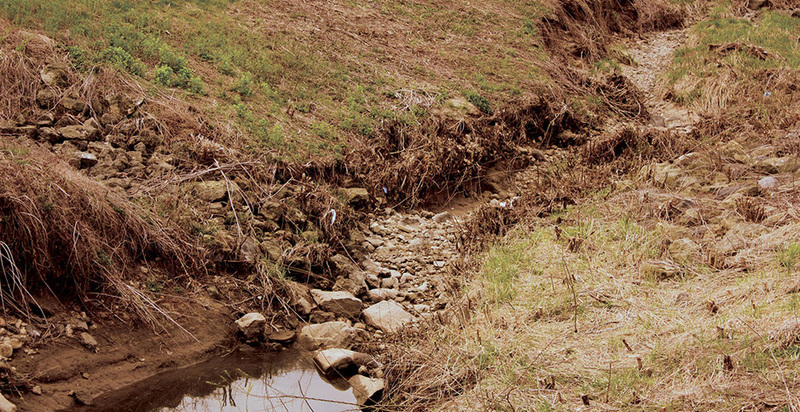 In flat areas, ephemeral streams initiate when roughly 24 acres of watershed drain to a particular area. Studies have shown that ephemeral streams initiate in areas where there are 2 acres of upstream watershed in steep areas and up to 24 acres of upstream watersheds in flat areas. So Trout Unlimited estimated that "unmapped" ephemeral streams existed in areas where more than 11 acres of watershed would be draining. "Anywhere below that point, we expected would be a stream channel," Fesenmyer said. Fesenmyer described this approach as a "conservative" one that will result in overestimating the number of ephemeral streams in flat places and underestimating them in wet landscapes. The result is an interactive map on Trout Unlimited's website where users can click on a watershed and see how many stream miles are mapped, what percentage of those mapped are ephemeral and the number of unmapped ephemeral stream miles Trout Unlimited estimates exist for every mapped stream mile. The group also put together some state-specific estimates. In Arizona, where 74 percent of the mapped 432,728 miles of streams are ephemeral, Trout Unlimited estimates an additional 0.6 miles of unmapped ephemeral streams exist. All told, that would mean an estimated 84 percent of stream miles in Arizona are ephemeral and would not be protected by the WOTUS proposal, E&E News calculated. While WOTUS is expected to have the biggest impact on states in the West, where arid climates mean more streams are dependent on precipitation, the Trout Unlimited mapping shows Northern and Eastern states will also be affected. In Maine, for example, where the NHD maps 57,107 miles of streams, none of which are categorized as ephemeral, Trout Unlimited estimates that 1.6 miles of ephemeral streams exist for every mapped stream mile. All told, that would mean an estimated 61 percent of Maine stream miles are ephemeral, E&E News calculated. Fesenmyer is quick to caution that Trout Unlimited's estimates are by no means perfect and that whether individual streams flow only after precipitation is best determined on the ground. Instead, he calls his work "a foundation." "There is going to be quite a bit of error associated with it, but it gives us a bit more of a ballpark than we had," he said. Asked about Trout Unlimited's analysis and whether EPA had considered doing a similar examination of the National Hydrography Dataset, an EPA spokesman said the agency would review it if it were submitted to EPA and the Army Corps during the public comment period for WOTUS. Trout Unlimited's approach to the National Hydrography Dataset is markedly different from the one taken by the Trump administration. When they announced their WOTUS proposal in December, the agencies initially denied that any estimates existed for how many wetlands and waterways would be excluded from their rollback of Clean Water Act protections. "If you see percentages of water features that are claimed to be in, or reductions, there really isn't the data to support those statistics," EPA Office of Water chief David Ross told reporters. The agency changed its tune after E&E News published documents showing that EPA and Army Corps staff had, in fact, reviewed the NHD data a year before publishing the WOTUS rule (Greenwire, Dec. 11, 2018). Now, EPA and the Army Corps wrote in their economic analysis of WOTUS that while the National Hydrography Dataset is "the best national dataset" of waterways, it cannot be used because it "generally does not differentiate between streams with intermittent or ephemeral flow in much of the country." Fesenmyer said his team at Trout Unlimited decided to look at the National Hydrography Dataset because they were unimpressed by EPA and Army Corps' jettisoning of the data. "Their explanations weren't adequate," he said.